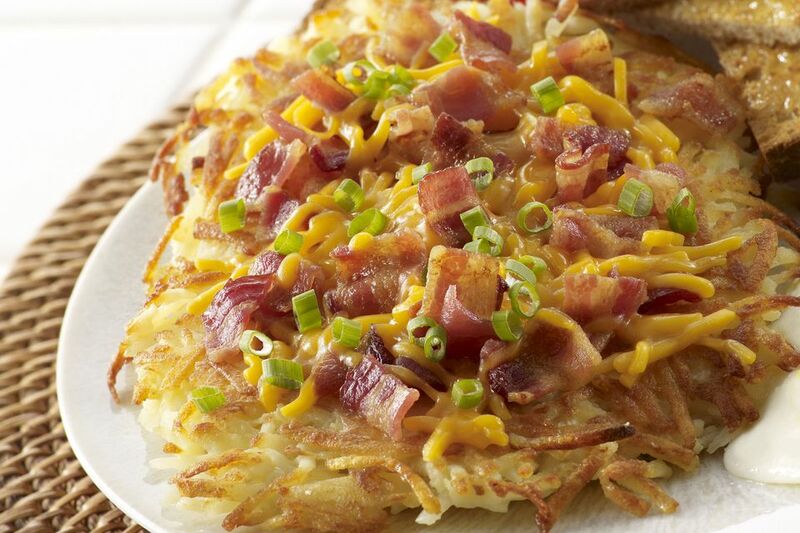 This breakfast bake is made with hash browns and eggs. The casserole gets loads of flavor from cheese, bell pepper, and diced ham. Thaw potatoes between layers of paper towels to remove excess moisture. Heat the oven to 425 F (220 C/Gas 7). Press potatoes into bottom and up sides of an ungreased 9-inch pie plate; drizzle the melted butter over potatoes. Bake for 25 minutes, or until lightly browned; cool on a rack for 10 minutes. Reduce the oven temperature to 350 F (177 C/Gas 4). Combine ham, cheese, and bell pepper; spoon into potato shell. Whisk together the eggs, milk, salt, and pepper, blending well; pour egg mixture over ham mixture. Bake for 25 to 30 minutes, or until set; let stand for 10 minutes before serving.